Description: This is an artist's conception of the NASA/Lockheed Martin Single-Stage-To-Orbit (SSTO) Reusable Launch Vehicle (RLV) releasing a satellite into orbit around the Earth. 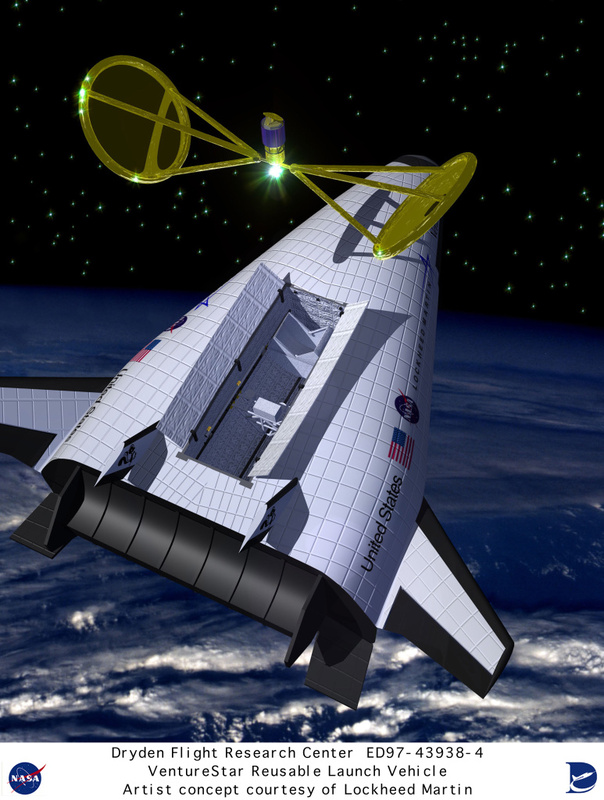 The X-33 was intended to be a technology demonstrator vehicle for the RLV. Description: The RLV technology program was a cooperative agreement between NASA and industry. The goal of the RLV technology program was to enable significant reductions in the cost of access to space, and to promote the creation and delivery of new space services and other activities that were to improve U.S. economic competitiveness. NASA Headquarter's Office of Space Access and Technology oversaw the RLV program, which was managed by the RLV Office at NASA's Marshall Space Flight Center, located in Huntsville, Alabama. Responsibilities of other NASA Centers include: Johnson Space Center, Houston, Texas, guidance navigation and control technology, manned space systems, and health technology; Ames Research Center, Mountain View, CA., thermal protection system testing; Langley Research Center, Langley, Virginia, wind tunnel testing and aerodynamic analysis; and Kennedy Space Center, Florida, RLV operations and health management. Lockheed Martin's industry partners in the X-33 program were: Astronautics, Inc., Denver, Colorado, and Huntsville, Alabama; Engineering & Science Services, Houston, Texas; Manned Space Systems, New Orleans, LA; Sanders, Nashua, NH; and Space Operations, Titusville, Florida. Other industry partners are: Rocketdyne, Canoga Park, California; Allied Signal Aerospace, Teterboro, NJ; Rohr, Inc., Chula Vista, California; and Sverdrup Inc., St. Louis, Missouri.